Dickey's second novel, 17 years after the great success of Deliverance, is by no means such a clear winner. It is a massive, ambitious, flawed book with many passages of breathtaking grandeur in both the conception and the writing, but with a puzzling hollowness at its center and moments of of melodrama that seem to have been created with an action movie in mind. The story is slight for a book of these imposing dimensions, and is clearly only an excuse for Dickey to work out a series of often profound, sometimes merely glib ruminations on the mysteries of flight, the nature of war, male bonding, the mystique of leadership and, above all, the starkly contrasting worlds of vision and blindness. Frank Cahill, the rather hazily conceived protagonist, is a newly blind man who journeys with his faithful but ferocious dog Zack to a WW II Air Corps training base in North Carolina where his son Joel has just been reported killed in an accident. He has never seen Joel, having separated from his mother before his birth, but as he goes around the base talking to officers and his son's fellow cadets, a strange picture begins to emerge: of a brilliant, charismatic student who has amassed a cult following called Alnilam (named after a key star in celestial navigation). Alnilam, a group difficult to take seriously, offers him dark hints about Joel's death, and has this scheme . . . . But plot, as noted, is not the novel's strong point. Dickey always writes like the poet he is, and his evocations of the blind man's world of breath, air, sound and movement, of the mysteries of flight, of somber winter landscapes, are hallucinatory in their power. (One experiment, howeverthe running of Cahill's sensations and the visible world in parallel columns on the page at certain momentsis merely awkward.) The characters, except for the base commander, are seldom very convincing, but their talk is a haunting blend of eloquence and rough country speech. There are two harrowingly violent climaxes and a real Hollywood close. 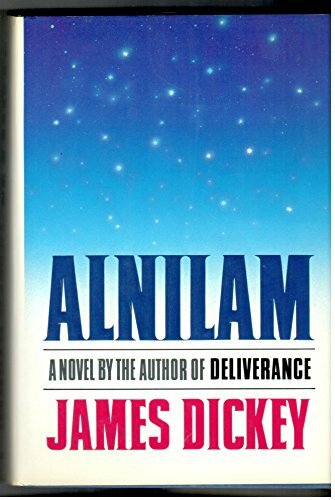 Alnilam is by no means an easy read, but for those who persevere there are the very real rewards of a vastly talented author extending himself and creating a world few writers could even imagine.